Time to sell your Land's End condo? Read about today's resort-market buyer. 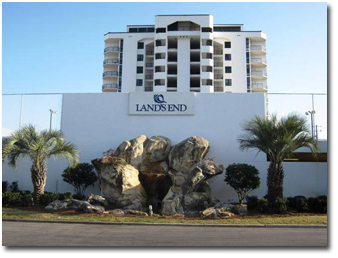 Land's End condominium is located on the pristine beaches of beautiful Perdido Key, Florida. The Gulf-front condos are located on Johnson's Beach Road in the central Perdido Key area. Land's End condos are all directly on the Gulf of Mexico. Amenities for the condos in Land's End include a Gulf-front pool, exercise room, gated entrance, clubhouse, and a tennis/racquetball area for guests and owners. The floor plans for Land's End condos are all three-bedroom condos ranging in size from approximately 1,800 to 2,200 square feet. The building was finished in 1985 and is close to a variety of restaurants, shopping venues, and local area attractions, such as the Lost Key Golf Club in central Perdido Key, Florida. Please let us know if you would like further info for Land's End or any other condos, homes, or real estate along the Florida Gulf Coast or would like to schedule a private viewing by emailing info@condoinvestment.com or by calling (251) Area-Pro (251-273-2776) for immediate assistance.